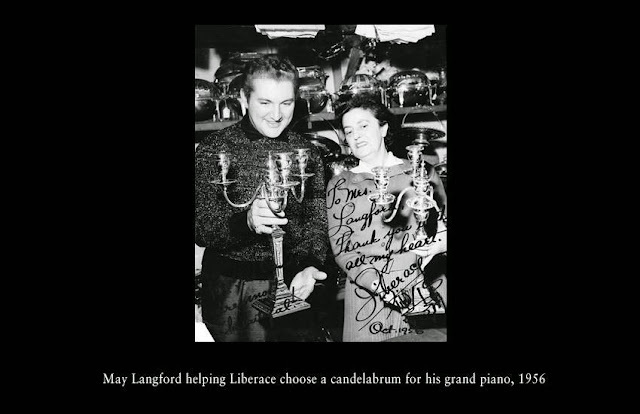 Liberace used to love to visit the London Silver Vaults when in London. One look around down here and it’s not difficult to see why. The shops down here are full to the brim with treasures. From the plain and simple styles often favoured during the Georgian period to the elaborate designs found during the Rococo movement you can find just about anything in a style to suit. If it was made in silver you will find it down here. Anyone who is familiar with Liberace will know what his style leanings were! Wladziu Valentino Liberace, born in Wisconsin on May 16th 1919, to working class immigrants and was destined for fame. A child prodigy, he had already become a piano soloist with the Chicago Symphony Orchestra by the age of just 16. Owing to his success, he was given his own TV show in 1952 which aired until 1955 and resurrected again in 1969. At the height of the programme’s success it reached 35 million viewers. It was here on this show that has flamboyant style emerged and we see for the first time the candelabra, which would go on to become his trademark. He often appeared on other people’s shows as well and became a huge sensation in Las Vegas. Here the glitz and the glamour could really come to the fore. Such was his popularity, he was once even joined on stage by Elvis Presley. In Vegas, he could really give the world a glimpse of his lavish lifestyle. Eventually, in the 1970s, he decided to really show the world his grandiose lifestyle by turning his Hollywood home into a museum. Here, one could see into the life of a consummate showman. He went on to open his own museum, in Las Vegas itself, in order to display his costumes and cars and, of course, his treasured candelabras. Never far from scandal, Liberace was often fodder for the press who were always quick to question his sexuality. In a famous libel suit against the Daily Mail, here in the UK, Liberace sued and won £22,000 in damages. When asked how he felt, he replied “I cried all the way to the bank”. Despite his huge, mainly female fan base, those ‘rumours’ would persist and in 1982 Liberace was to find himself in court again this time being sued by his former bodyguard and chauffeur, Scott Thorson, who claimed he and the virtuoso had been in an intimate relationship with the entertainer promising to support him. Liberace settled out of court. In the mid-eighties Liberace became ill and again the subject of the gossip mongers who claimed the star had AIDS, which he strenuously denied. He was concerned that if the public were to believe he had been stricken by the disease that would be all they would remember of him. Alas, the rumours proved to be true, and on 4 February 1987 Liberace succumbed to his malaise. His body rests at Forest Lawn, Hollywood Hills Cemetery in LA. Eventually his museums and properties were shut down and sold off, with the Liberace Foundation making plans to relocate the museum to Downtown Las Vegas. Sadly, that has yet to happen. Bizarrely, Liberace is set to do a comeback tour, as the Foundation is working with Hologram USA to promote a world tour featuring the man himself in three dimensional, digital form. This is a fitting tribute, as this was a man for whom the show really must go on.